Our childhoods are filled with creativity; from traversing burning lava floors to going on grand adventures with your toys. But then, as happy as the brightest moments are, there are the darker sides to remember. The monster in the cupboard; the demon that waits for the lights to go off; the hand that grasps your ankle from under the bed; we forget that children have the most powerful imaginations, during good times and the bad. Hell, some of the things I was scared of as a child I’m still not completely over – don’t tell me you don’t still dash upstairs at night when you turn the hallway light off. This is where Krillbite Studio has been very clever with Among the Sleep. 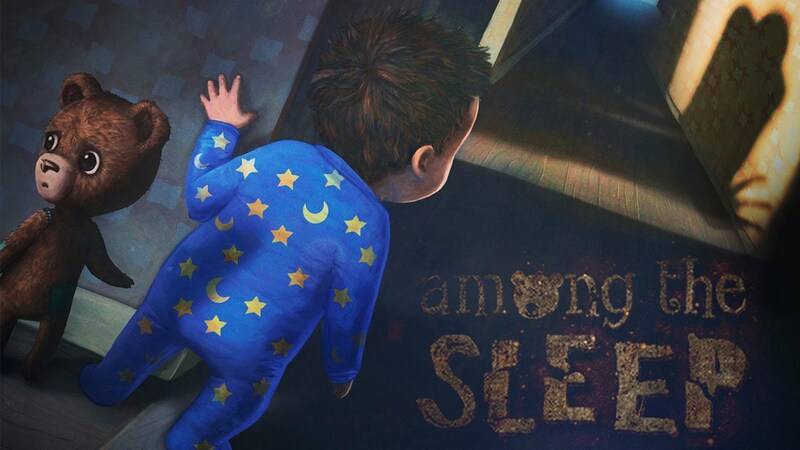 Among the Sleep is a first-person horror game played through the eyes of a two year-old boy looking for his mother. In the beginning it’s your birthday, your mum gives you a piece of cake and a talking teddy bear and everything is colourful and bright and fun…until someone knocks on the door and the yelling begins. After getting rid of the unseen intruder, your mum picks you up and walks you to your room and thus the opening credits start rolling. Each name twinkles into place before a cancerous darkness engulfs it, setting the tone of the game in a very abrupt and effective manner. The brightness continues for a few moments more in your bedroom while you’re walked through a very simple tutorial by the bear using suggestion, i.e. ‘try picking up this’ or ‘try and find the pink elephant’, but the last part eases you into how uncomfortable this world can be. You enter a seemingly-empty cupboard, shut the door and everything is pitch-black. When you hold your teddy close and the room lights up we see coats – big, dark coats that give the appearance of cloaked people and suddenly I remembered how afraid I used to be of things like that. 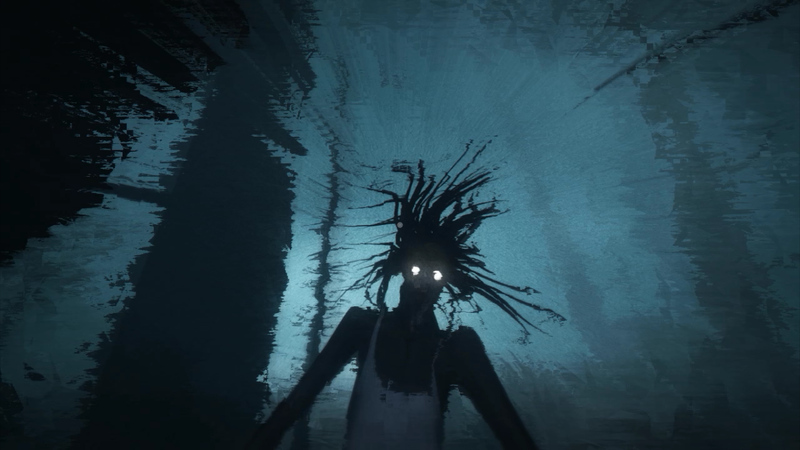 This is not a game that makes you jump out of your skin with sudden movements and sharp noises; it’s a cleverly designed psychological horror. We’re spoon fed suggestions of things to come in the first two memory levels, relying on the atmosphere to leave our skin prickly and cold. It’s only at the end of the second level that we’re actually introduced to the ‘monster’. Don’t get me wrong, there are certainly parts of the game where I did jump quite heartily, such as a pair of boots falling off the bed to look like feet swinging onto the floor, and the best part of the whole experience is that you’re completely and utterly helpless. Just like in games such as Amnesia, Penumbra or Outlast, we have no weapons to defend ourselves so instead have to be cautious when navigating the environment, ducking under footstools and tables to wait for the monster to pass by. If you’re caught by the monster it’s game over – back to the last checkpoint. What I would have loved more than anything as a player is if they included more trickery, more evil little jumps and shivers without overdoing it. The puzzle solving is not ground-breaking, nor is the general gameplay, but I honestly don’t care. Minor details such as the disjointed text on packages, books and signs, the inability to walk on two legs for long periods of time and the little grunts you make when climbing up to higher areas are such wonderfully attentive things to include. These alongside the audible factors, such as the mother’s lullabies whispering across the wind, make the portrayal of your age so very believable that you become more involved in the experience, whether as a child or as an adult. The overall design of Among the Sleep is also extremely well done. When you reach this other world, each environment is scattered with tables, chairs, stools, beds, even from the very beginning before the monster appears. It’s particularly important to do this in horror games because then we’re always on edge. Psychologically speaking, in the past when a game provides you with anything, whether it’s a gun, a key or cover, you’re going to have to use it soon after. In Among the Sleep this environmental littering of pieces becomes foreshadowing with no clear point in which the cover will come into effect – a little bit like in Alien: Isolation, though the monster (i.e. Alien) in that is much more determined to chomp your face off. On a more negative note, my version of the game was on PlayStation 4 and I’ve had issues in the past when PC games are released onto console, or even when games are remastered, their performance suffers initially until a patch comes out to fix it. At several points in Among the Sleep I experienced severe drops in framerates and incomplete/environmental glitches you could essentially just walk through, both of which resulted in death or getting stuck and having to restart. I also – and entirely accidentally – broke part of the game by dragging a chair into another room. It got stuck in the doorway, trapped me inside, and I had to start the level from the beginning. That’s not so much a developer hiccup as just me being a complete and utter idiot – I would go for the latter. Finally, my one undecided thought of the whole experience is that a small, but loud, part of me almost wishes that the ‘monster’ wasn’t that obvious. I enjoy psychological horrors much, much more than regular chase-you-‘til-you-cry sorts and though I understand that the connotation of the monster in keeping with the overall theory of its existence is more potent when actually witnessed, in some cases fear is best built blindly. In another version of Among the Sleep I reckon it would have been excellent if the monster was merely something that hung on the very edge of your vision; something that always lurked just out of sight. But that’s purely my own opinion and as such it doesn’t affect my overall experience. Among the Sleep is a wonderfully dark game that touches on life as a child with a not-so-happy childhood. We come to a conclusion whilst playing that, after an overly-sweet introduction to her, our mother whom we’ve been searching for is not all there. The chaotic environments we have to conquer are scattered with bottles and broken plates and glasses. Sometimes we hear yelling and weeping and it’s easy to make our assumptions, especially come the final scene where all the pieces fit together. No, it’s not the first time it’s been done but it doesn’t make it any less or more effective than in games such as Papo & Yo. Even with its short play time and limited features, Krillbite Studios has succeeded in creating a creepy game with a powerful message and that’s all we really want in the end isn’t it? 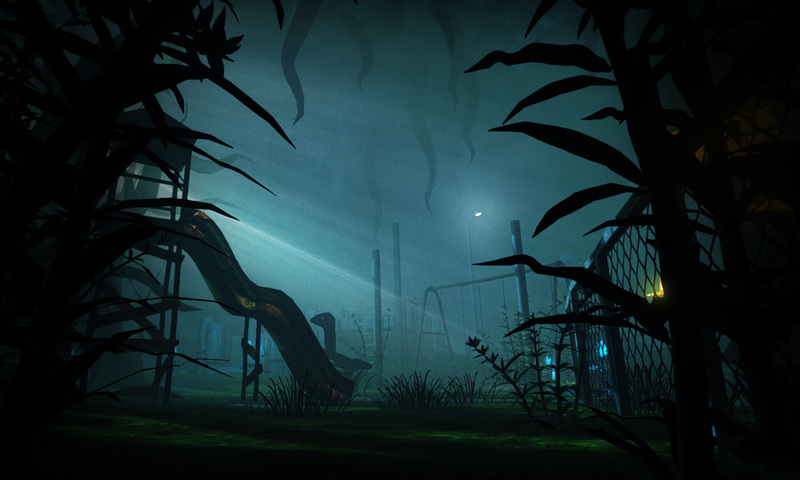 Among the Sleep isn’t a game we’ll be forgetting about any time soon.